Designing a cruising sail that works well, is easy to use and will last is not an easy process. At VSP, we custom build every sail to match the specific needs of our customers. It is a pleasure for us to work with you to create the perfect sail for your boat. Whether you need a sail you can trust for your ocean voyage, or a economical, value oriented, weekend cruising sail, we will build the best sail we know how. Let the experienced sailmakers at VSP work with you to create a sail that will provide the best combination of handling, durability and value. VSP Cruising Headsails are built to last longer and work better. For our traditionalist hank on customers we offer a traditional looking headsail that benefits from modern construction, design and materials. We even offer a row of reef points for our smaller hank on cruising headsails. Choose crosscut Dacron or a radial design using polyester Pentex or Spectra cruising laminates. 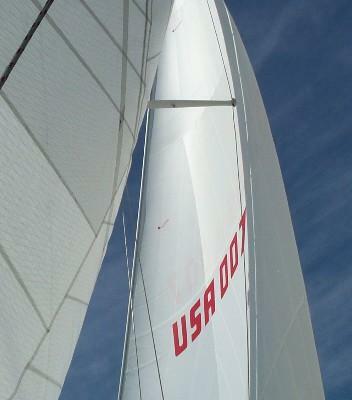 The VSP Roller Furling Cruising Headsails are built to be durable and furl easily. We use furling specific corner reinforcements, so when the sail in partial furled there is some reinforcement available at the tack and head. We recommend a cruising laminate in a radial design for roller furling ease, but build many crosscut sails for our customers on a budget. We never use economy grade materials in any of our sails. Non Roller Furling- Crosscut or Radial design incorporating premium sail materials throughout, Bolt Rope and Hanks, reef points available on 115% and smaller, heavy duty leech line with aluminum cleats and protective flap, oversized radial corner reinforcements, draft stripes and heavy cloth storage bag. Roller Furling Sails- Crosscut or Radial design incorporating premium sail materials throughout, Premium Luff Tape, Sunbrella Acrylic sun shield, foam luff reefing pad, heavy duty leech line with aluminum cleats and protective flap, oversized furling specific radial corner reinforcements, draft stripes and heavy cloth storage bag. Sunbrella Acrylic Fabric comes in your choice of a wide range of colors.